Greg / August 25, 2015 / Comments are off for this post. Let’s face it, no matter how careful you are, stains happen. If you happen to have children or pets, stains are probably a common occurrence. 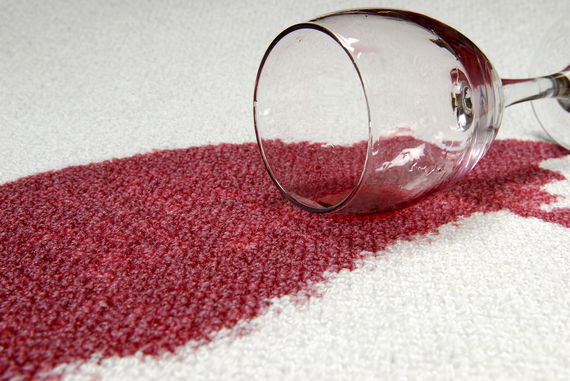 Often, successfully removing a stain means acting as quickly as possible. However, what do you do if something is spilled on your carpet or furniture and you are all out of store bought stain remover? The answer may lie in your refrigerator, bathroom, or pantry. In this article from The Huffington Post, you are given several DIY remedies for the removal of just about any type of common stain you could think of. Everything from wine, grass, coffee, ink, and even blood, can be removed with everyday items found in most homes. Grass stain on your patio cushion. Wine stain on your carpet. Ink stain on the couch. Let’s face it, even when we try our very best, life is messy. I have put together a list of some of the toughest furniture and carpet stains we encounter along with quick DIY eco-friendly fixes that will help get your fabric back to its stain-free state. Blood: Mix one tablespoon of liquid dishwashing detergent (POPSUGAR has agreat recipe for natural DIY solution) with two cups of cold water. Apply the solution to a clean cloth and blot the stain until it disappears. Gum: Put a plastic bag full of ice directly onto the stuck gum. Once it hardens, you should be able to scrap it off. If the piece of fabric is small enough, you can place it directly in the freezer until the gum hardens. Chocolate: Rub the stain in a circular motion with warm, soapy water or aborax solution. Rinse with cold water. Coffee or Tea: Spot-clean with cool water or vinegar or try an enzyme-based cleaner. Grass: Rub the stain with hydrogen peroxide. Ink: Wet a clean cloth in vinegar and blot the stain–rewetting the cloth with vinegar as needed. Once the stain is gone, rinse with clean water. Grease: Apply dry cornmeal to the spot and let sit for 20 minutes. Once you shake it off, the stain should be gone. You can also try cornstarch. Makeup: Carefully put few drops of glycerin on the stain and scrape off. Tomato Sauce: Alternately blot the stain using a damp sponge (cool water) and dry cloth. If possible, move the cushion or rug into the sun–the UV-rays will help breakdown the stain. For stubborn stains, rub with a cut lemon. Red Wine: Spot clean or soak in cool water. Pour salt over the stain while it is still wet and let it sit until it begins to turn pinkish. Discard the excess salt and vacuum. Greg / August 18, 2015 / Comments are off for this post. We are nearing the end of August, which means all across the country parents and children alike are preparing for the upcoming school year. That’s right, back to school time. Time to stock up on school supplies and maybe a few new outfits before the first bell rings. While a new school year is usually an exciting time of year, it can also be pretty stressful as a parent. To help you prepare for this upcoming year, Greenability Magazine, has put together a few tips to help make this school year a little easier and a little greener! Go back to school in style with a sustainable and economical pack of supplies. As summer fades into fall, the hustle and bustle of back to school shopping begins. The pressure to buy new clothes and school supplies, along with healthy daily lunch prep can be tedious and time consuming for the eco-conscious shopper. With a little planning and these back-to-school tips, your fall transition can be easy on you and the environment. 1. This school year, skip the disposable plastic sandwich bags and choose BPA-free reusable containers instead. 2. Pack a washable cloth napkin, thermos and reusable utensils. 3. Pack lunches the night before, and choose fresh fruit over prepackaged food. 4. When buying fruits and vegetables for school lunches, support local farmers markets. 5. Use a stainless steel or up-cycled lunch box. 6. When buying supplies, resist the urge to buy in bulk. Instead, find last year’s unused school supplies and look for items that can be reused. 7. Designate a storage space for school supplies at home to prevent overbuying every year. 8. Buy recycled paper, and encourage your kids to start recycling now to make it a life-long practice. 9.Consider using cardboard or canvas binders instead of standard plastic binders. 10. Choose refillable or biodegradable pens and recycled pencils. 11. If this is the year for a desk or computer for your student, consider buying used or repurposed items. Surplus Exchange, 518 Santa Fe St., Kansas City, MO, sells gently used and refurbished computers, laptops, iPads, tablets, printers and other electronics. There’s also a big supply of desks, chairs, file cabinets and other furniture. 12. The first day of school outfit can be a big decision for kids and parents each year. Make sure your students know that trendy and fashionable clothes can be found in thrift shops and second-hand stores. Always check that each potential purchase is in its best condition, unless you plan on repurposing and restyling it. YouTube is a great resource for thrift store inspiration with “Thrift Store Hauls” and tips for finding the best quality and deals on kids and adult clothes. If you are not in need of school clothes, use the thrift store as an accessory haven for other back-to-school needs. Greg / August 7, 2015 / Comments are off for this post. Is your closet cluttered with a number of shirts and pants which are either a little out of style, or perhaps just don’t fit like they used to? Or, maybe you have a closet that has become more of a storage unit for items you rarely use or forgot you even own anymore? If either of these rings true for you, it may be time to think about cleaning out and decluttering those closets. Cleaning out a closet can actually be a fairly simple and productive task. In fact, the good people at Seventh Generation, have put together three simple steps to help guide you in getting those closets decluttered. Check out the article below, and get back some of that precious closet space! Once you’ve washed, repurposed or donated – it’s time to clean and organize your closet. Use disinfecting wipes on the shelves in your closet to pick up dust that may have collected over the years. Then, you can organize by clothing type, color or size. The real trick? Keeping it organized all year round! For more tips on closet cleaning and organizing your home, you can also check out this post on Tips for Organizing Your Stuff For Storage by Maximum Exposure Real Estate.